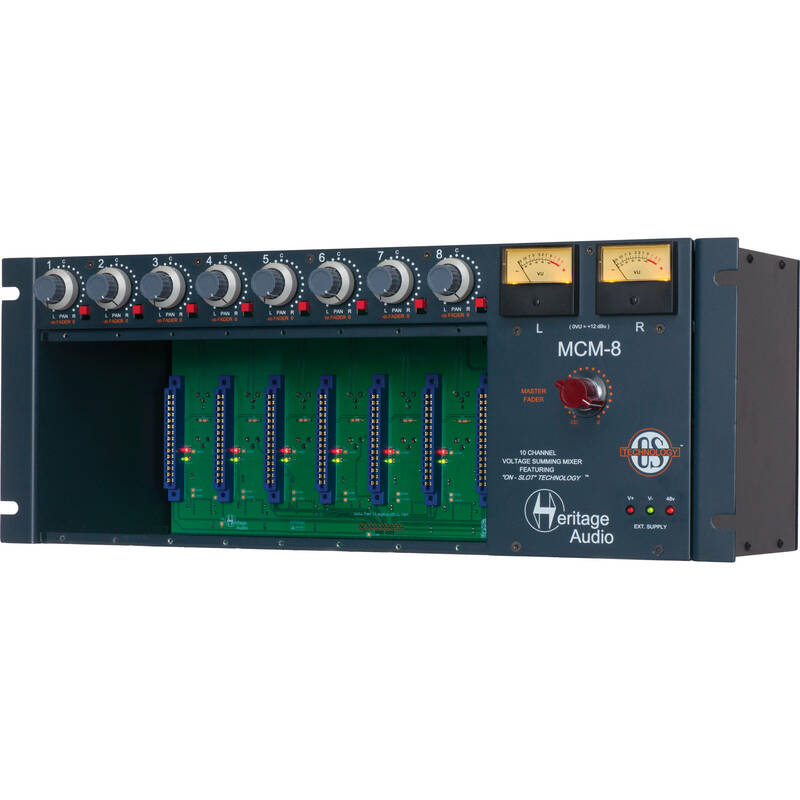 The Heritage Audio MCM-8 Mixer is an enclosure for up to 8 lunchbox style 500 series modules, both from Heritage and other manufacturers. What makes the enclosure special is the company's "On Slot Technology," which leverages the latest generation of power electronics to provide a supply of power on a "per slot" basis. Each slot has its own power supply linear regulation stages, which makes each module isolated from the rest. This helps address some of the issues encountered when modules of different kinds share one common power supply. Instead, they simply share the same heavy gauge steel enclosure. On the side of each connector, each slot features test LEDs for checking the correct power operation (red for +16V, green for -16V). The power capability of the unit is 400mA per rail per slot maximum, with an overall of 1.4A (1.6A non continuous) per rail, whichever is reached first. The total available phantom power is 140mA. The heavy gauge steel enclosure has an aluminum front panel and was constructed in the United Kingdom. There are pan and fader controls per slot on dual concentric potentiometers. Pan pots have a center detent for precise center positioning. Each channel features an ON switch to assign the channel to the mix bus. The mix bus follows a passive, voltage summing topology, similar to that found in the 80 Series consoles from the1970s. The gain loss is restored by the same Class A, 2n3055-driven, transformer-based output stage used in the 1073 by which the company is known. An additional stereo Input is provided on the back of the unit, allowing several units to be daisy chained, or signals not needing further 500 series processing to be mixed together. Box Dimensions (LxWxH) 22.756 x 11.496 x 10.0"
How can I link pin6 to the next module for stereo operation? Does the unit come with a power supply? 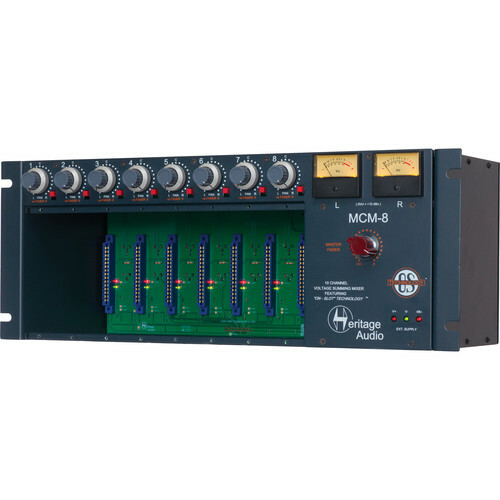 Heritage Audio MCM-8 Mixer Enclosure for 500 Series Modules comes with a power supply 4 pin XLR to 110V or 220V. Then each slot has its own power supply linear regulation stages, which makes each module isolated from the rest.